FRAMINGHAM, Mass.--(BUSINESS WIRE)--Jul. 1, 2016-- Whether you work at a concrete plant, engineering firm or healthcare provider, the U.S. workforce shares at least one commonality: the need to take a break and recharge during the workday. Recognizing the appeal of office breaks for their own workplace, almost 3,000 businesses pleaded their case to Staples Business Advantage, the business-to-business division of Staples, Inc., as part of the company’s “Ultimate Breakroom Makeover” contest, and today five finalists were announced. 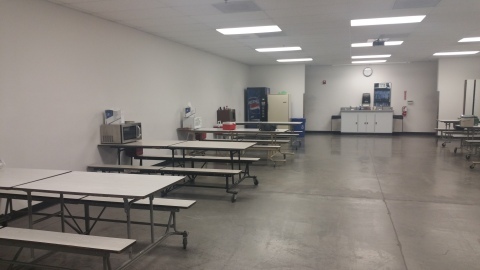 The five companies hoping for a breakroom facelift include: Braun Northwest, Inc., Chehalis, WA: The employees at Braun Northwest – a manufacturer of emergency vehicles – have an interior designer turned procurement manager with creative ideas in mind for their breakroom – which currently “could be confused with a prison facility.” The company would fulfill its vision with a new paint job, better lighting and matching seating.